The economic crisis continues to pre-occupy the minds of all who are concerned about Tanzania. In this issue we concentrate on three aspects of the crisis: the possibility of an agreement with the IIF; the new relationship between the Government and the Party arising out of Mwalimu Nyerere’s retirement; and agriculture. In his article “Tanzania: A Time For Decision” Colin Legum writes about the first two of these issues. It is possible that by the time this Bulletin is in your hands, some of the key decisions to which he refers will have been taken. An inkling of the way in which the discussions are being conducted is explained in the article “Seminars and Workshops”. But half of this issue is a sixteen page supplement on the prime mover (or, as some tight say, non-mover) of Tanzania’s economy – agriculture. Two of the British contributors to this supplement have been in Tanzania recently. Another contributor, Michael Stocking suffered another kind of shock. He was robbed on the mountain road near Amani in Tanga Region losing all his belongings, two months data from work done for the FAO in Zimbabwe, and the manuscript for part of a book he is writing. Getting out of Tanzania without money, passport or an air ticket, he describes as an “interesting experience”. He told me that thanks must go to the border guards at Namanga for taking pity on him and letting him cross into Kenya without so much as a single piece of paper, the Regional Representative of the International Union for the Conservation of Nature (IUCN) in Nairobi for his care and concern and Belgian World Airlines for taking home an unticketed, very dirty and poor passenger with no luggage!. The rains have come early this year in Tanzania, bringing the promise of a second successive year of good crops with only the threat of some damage being caused by the spread of the maize borer worm. However, even two seasons of good harvests are not going to be adequate to rescue Tanzania from its desperate economic crisis and decline, which has now lasted for almost thirteen years beginning with the quadrupling of oil prices in mid-1973, compounded by adverse international trading conditions, drought and a number of major errors in Government policies. Julius Nyerere’s successor, President Mwinyi, faces the need to decide in the next few weeks whether his Government will finally come to terms with the International Monetary Fund (IMF) to assure an injection of fresh capital aid and foreign exchange or whether to try and overcome the country’s economic crisis by relying on its own resources involving major sacrifices for years to come. Tanzania’s most loyal foreign aid givers, the four Nordic countries, have collectively advised the Government that the level of their future aid will depend on practical evidence of structural economic reforms. The political debate over whether to reach an agreement with the IMF or not, though not aired much in public, is being waged with passion and vigour behind the scenes. The signs are that the Government is itself deeply divided, as is the Party. More than that, some of the leaders themselves appear to be divided in their own minds. They do not have much time to decide on their future course of action since the national budget is due to be presented in June. If the decision goes in favour of a deal with the IMF, it will require a decision within the next month at the latest. The preliminaries with the IMF have already been largely completed. The economic debate is being conducted at the same time as the leadership faces the need to clarify the ambiguous relationship between the Government and the ruling party. So long as Julius Nyerere was both President and Party Chairman, the institutional relationship between Government and Party was difficult but not impossible to handle. The situation is quite different now that the country has a powerful figure in the form of Nyerere at the head of the ruling party – which is responsible for determining policy – while the Government has a new leader (Mwinyi), who is expected to assert his independence. Mwinyi and Nyerere are in no sense to be seen as rivals; in fact, they complement each other. However, Nyerere is now concerned with rebuilding the authority and organisation of the Party which has lost some of its popular base in recent years; while Mwinyi is being looked up to by the country to demonstrate that he can fill the role of an independent President. Critics of past Government policies featured prominently at an economic policy workshop convened by the Finance Minister to discuss policies and strategies for economic recovery. One of the most widely discussed papers was presented by two University economists, Professor Idulu and Dr. Lipumba. They summed up the nature and extent of the economic crisis as a slowing down of economic growth, declines in real per capita income, high rates of inflation, severe reduction in import and debt-servicing capacity, and a general breakdown of the Government control systems exemplified by the growth of parallel markets including a growing black market. Real growth in the gross domestic product (GDP) declined to an average of 0.72% per annum between 1979 and 1984 – down from the average of 2.9% between 1976 and 1978. If one takes into account the rate of population growth this means that there has been a negative growth rate since 1979 amounting to minus 0.67%.The combined effects of a slowing down of production and high inflation reduced real incomes of both rural and urban dwellers. According to ILO estimates for 1985, rural incomes have declined since 1979 by 13.5% and for urban wage-earners by a massive 65%. The overall decline of Tanzania’s foreign trade balance has been spectacular. In 1977 the country still had a surplus of about £27 million; by 1984 the negative balance had reached almost £105 million. Real imports declined by 42% between 1978 and 1982. The country’s inability to pay for imports led to an accumulation of arrears of payments amounting to $764 million during the 1980-84 period. During the past six years export earnings financed less than half the cost of imports. This meant increasing dependence on an external inflow of funds to finance even the reduced level of imports. The volume of exports has fallen continuously from its peak in 1972. Although there were other factors accounting for this fall – such as the bottlenecks caused by a lack of foreign exchange – Ndulu and Lipumba insist that this is only a partial explanation. In their view the basic problem has been an “incentive structure and institutional set-up” that, over time, has discouraged peasants and farmers from an increasing production in general, and export crops in particular. The only sector that has persistently maintained high rates of economic growth from the 1970′ s has been the public administration. The authors stress the widespread laxity in management and public administration and the lack of accountability at all levels. And they argue that “without linking rewards to performance and responsibilities. it is unlikely that a sustainable recovery can be initiated even when the level of resource inflow is increased.” They criticise the institutional rigidities and unresponsiveness to economic changes that characterise governmental and parastatal organisations, as well as excessive centralisation. The two economists come out firmly in favour of an agreement with the IMF which they say is necessary to unlock bilateral aid resources. Even then they envisage as “shock treatment” a period of eighteen months with a five year horizon to achieve sustained adjustments of the economy. The additional inflow of foreign resources, they suggest, should be at least $335 million for immediate needs. They also propose adjusting the exchange rate to 40/- to a dollar – in fact, a substantial devaluation; but the effect of devaluation of exports should be passed on to agricultural producers. Nominal prices should be increased by at least 65%. Colin Legum has referred in the paper above to a seminar and a workshop. But during the last 3 months there has been a veritable plethora of seminars and workshops as Tanzania struggles to solve its serious problems. Eight have been reported on in the pages of the Daily News between January and March ’86. There is every indication that at this particular seminar there were some fairly heated and emotional exchanges particularly on the issue of the IMF. Ndugu Warioba’s words on this are interesting: “In his opening remarks the President encouraged you to make comprehensive studies and analysis of the foreign institutions, multilateral and bilateral recovery packages as well as our own internal adjustment programmes and come out with some practical recommendations for the Government to consider. I have read some of the papers presented at this workshop and I have also read about your discussions. But I feel we have stagnated or we are becoming stereotyped. We should not treat this as a subject for a debating club where you pick a subject, you have a proposer and an opposer, you debate and the matter ends there. This country faces a very serious economic crisis. With or without the IMF things will be very tough for the next several years. A stabilisation package is not going to be a novel thing, not even for Tanzania. Many countries have had stabilisation packages, with or without the IMF. A singular note had been struck a few days earlier in a commentary in the Daily News but this also included some reference to the British position. “The IMF is not formally on the agenda but their demand for a devaluation of up to 50/- to the dollar and an increase in interest rates to 35% are uppermost in the minds of those who have been negotiating with the IMF. As if to pre-empt the discussion of alternatives to the IMF only this week a British Minister (as if she forgot the present place of Britain) urged Tanzania to enter into an agreement with the IMF. Fortunately Tanzania’s diplomacy is sophisticated so there has not yet been any public rebuke. “Britain is not in a good position to offer advice on assistance to Africa especially at this time when the position of the British leadership is probably the most extreme in defence of apartheid. Moreover among the OBCD countries the level of British aid is now the lowest, given the free market ideas of the present leader. As a long standing trading partner of Tanzania, Britain has been one of the tightest in the offering of export guarantees to Tanzania. Her leaders find it easier to lend to South Africa than to Tanzania. This is why Tanzania’s indebtedness to Britain is relatively small, much smaller than Tanzania’s present debt to Algeria or to India. “One clear lesson to be learnt from other experiences so far is that there is no quick remedy for recovery. Whatever the strategies they will have to be borne on the shoulders of the vast majority of the working poor of Tanzania. The question will be which sections of the society will bear the burden of recovery. Will it be borne by all or by the poorest of the poor ? It is clear that economic strategies will need political change so the balance between the required political changes and the specific alternatives are significant. He reiterated, however, that whether or not an IMF package was won, a realistic solution to Tanzania’s economic problems depended on what the people did to improve the situation through higher agricultural and industrial production. One of the measures the Government has already taken to deal with the economic crisis was referred to by Ndugu Daudi Mwakawago, the Minister for Labour and Manpower Development at another seminar organised by the Union of Tanzania Yorkers (JUWATA). “The Government expects to save 190 million shillings annually following the laying off of 12,360 civil servants last year” he said. He went on to say that 14,117 other employees were layed off by parastatal organisations under the cost reduction exercise, affecting a 160.8 million shillings saving in salaries and another 964.2 million shillings in operational costs. He told seminar participants that more lay-offs could not be ruled out at this point. “I can’t say how long the exercise will take – it all depends on the economic performance,” he said. He explained that if the situation deteriorated the Government might be forced to scrap some public institutions along with their employees. The Government had earmarked 27,261 workers for redundancy to save 305.9 million shillings, but 15,354 of the Employees were absorbed by local Governments. Ndugu Mwakawago pointed out that apart from the lay-offs, the Government had cut down the number of ministries from 21 to 14 under the cost reduction measures. He said all but 108 of the civil servants declared redundant had received their terminal benefits by the end of last month. Ndugu Mwakawago said an appeals committee formed by his Ministry received 333 complaints by lay-off victims last year, 60 of which were proved genuine and the complainants ordered reinstated. At a seminar in Arusha organised by the Institute of Engineers in Tanzania (IET), the Minister for Communications and Works, Ndugu Mustafa Nyang’anyi said that the country was only too aware of the unsatisfactory implementation of development projects. “The Kirumi Bridge project, for instance, which you will also be discussing in this seminar, has taken us twelve years to complete instead of the initially planned three years”. He told the nearly two hundred engineers attending the seminar that a technical audit system to ensure that Government and parastatal projects comply with established standards is to be introduced in the country soon. This was aimed at curbing wastage of millions of public funds, he added. The Minister said that the audit system had been decided upon because foreign firms which were mostly responsible for planning and designing local projects, did not always comply with standards applicable in Tanzania. The foreign firms did not only plan and design local projects, but also executed and supervised their implementation with very little involvement of the local engineers, he pointed out. “The case of the Mbeya cement factory serves to illustrate this point”. Seminars have also been held on “Productivity Management at the Shop Floor Level” in Zanzibar and on “Strategies for the Development of Women and Children” on the mainland. 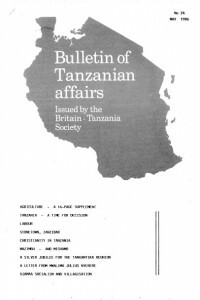 “Africa Now” had a sixteen page supplement on Tanzania in its January 1986 issue. An article on “Labour in Tanzania” highlights the power of the Union of Tanzania Workers (JUWATA) and explains that under Tanzanian law if a firm sacks a worker without involving the relevant JUWATA branch the result is the declaration of a labour dispute . A particularly prominent dispute before the Labour Tribunal at the time the article was written was said to be the one resulting from the decision of TAZARA to make redundant one hundred of its employees. The former Zambian born General Manager, Mr. Charles Nyirenda, was facing a charge in the Magistrates Court. He was being accused of acting as an individual against the law but his defence was that he was acting as General Manager after being advised by the TAZARA Board of Directors. A review by Ursula Hay. Channel 4 TV broadcast on March 20th 1986 a programme in the series “The Christians – Missions Abroad” which was largely filmed in Tanzania. Ursula Hay writes as follows: This was a repeat of one part of a series by Bamber Gascoigne originally shown a few years ago. It opened with scenes of Bagamoyo, the centre of the slave trade and followed with David Livingstone’s appeal in Cambridge for the Church to open up Africa to commerce (offering an alternative to the export of slaves) and Christianity. At that time Europe thought it had everything to offer Africa in the way of culture and religion and nothing to gain. Bamber Gascoigne shows, first in Masasi Diocese with Father (now Bishop) Norgate, then in Dodoma and finally with the White Fathers in Tabora, how that attitude has changed. In Masasi the acceptance of Christ and the Church by the people and their making it their own was clear. In the Dodoma area we saw the use of cassettes for teaching in the villages, “practical armour far a spiritual campaign”, while in Tabora the Church was actively integrating African culture into Christian worship, using local tunes, drums etc. The film was sensitively produced and left me with a mixture of joy and sorrow. Joy at the spread of a deep and living Christianity and recognition that Africa has much to teach Europe and sorrow that the Church has failed to bring the Christian message to any but a small proportion of the population of industrial Britain. The final scene was of the destruction of a redundant church in Sheffield. A review by Noel Thomas. Channel 4 TV has also presented a penetrating programme on Mazimbu, the home which the Tanzanian Government has provided for South African exiles. Noel Thomas has written for us the following review: There are several reasons why this very factual report was much above average and deserved a wide viewing audience. First, it provided an excellent illustration of a foreign Government which was actually prepared to do something positive and valuable about one of the world’s greatest crisis points. Very soon after the Soweto riots, South African refugees, many of them young, began arriving in Tanzania, and rather than have all of them dispersed and restless, with no positive goals, the Government of Tanzania gave to the African National Congress an old sisal estate of some three thousand acres, not far from Morogoro. It was made clear from the start that this was to be a social, educational and administrative project, and not a military training camp. This was the beginning of the Simon Mahlongo Freedom College, which is now known as SAMAFCO, and is a central part of Mazimbu. The project is very much associated with the Morogoro area of Tanzania, and in no way considers itself an isolated pebble on the beach, for exiles only. Another interesting feature of the programme was the way in which it demonstrated the real links between Tanzanians and other African peoples. Mazimbu has grown into a large complex of buildings and institutions; in fact the Director of SAMAFCO, Mr. M. Tickley, described it as “a small town”. 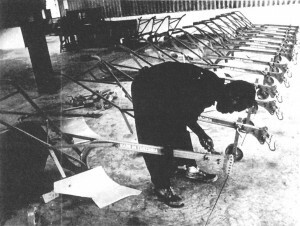 There are three distinct groups of workers: first, the ANC people themselves, amongst whom are teachers, nurses and administrators; the second group are all Tanzanians – they supply a good many workers for the construction section, and also a number of professional administrators and organisers; finally, there are a number of volunteers, black, white and coloured, sent by various foreign governments. Some of the teachers in the secondary school certainly seemed to be English and were obviously greatly enjoying life in Tanzania. Mazimbu has therefore become virtually a Tanzanian pilot scheme for international co-operation, in which mixed races, and several different African nationalities combine to use their best resources in order to integrate educational and professional training. The Mazimbu complex has developed amazingly in the past six years, and now incorporates: infant, primary and secondary schools; a youth training centre; a farm which makes the community virtually self-supporting and also teaches farm management; a carpentry unit; a clothing factory; a centre for rural industries and a photo laboratory. There is also a transport section, serving the needs, not only of Mazimbu, but also the Tanzanian local community. But perhaps the single most impressive feature of this fine documentary was that most of the people interviewed not only paid tribute to the hospitality of the Tanzanians, but saw Mazimbu finally as a symbol of African co-operation which Tanzania itself can use when, one day, the South African exiles have returned to their own country. When Mazimbu was started, the regional health provisions of Morogoro were already overstretched and the area needed more hospitals, doctors” and nurses. But now that Mazimbu itself has a thriving medical centre it is able to treat a great many Tanzanian patients, and offer its specialist facilities to all who are in need. This has been greatly appreciated by the local community in Tanzania. The key-note of the entire project was summed up by two quite different speakers. One South African youngster was obviously very moved when he said “The support we receive from friendly nations of the world, and especially Tanzania, is deeply appreciated by all of us.” And the Director, Mr Tickley, went further : “we believe that Mazimbu is nothing less than a monument to all the black people of South Africa and the people of Tanzania alike. When we leave, this complex will be handed over to the Government and people of Tanzania, and we hope that they will use it for education and training, so that it may play a valuable part in their social life. As the hazy blue mountain ridge of the Morogoro area faded from sight and we saw the last of Mazimbu I was very impressed by the fact that I had not seen a single gun, or soldier, nor had I heard a word of violence or war. The music and laughter and glorious natural scenery of the Tanzanian countryside had spoken far more eloquently than all the sounds of battle. The January 1986 issue of “Refugees” wrote about another refugee settlement – Mishamo – situated in the midst of the vast, unpopulated, tsetse infested, miombo wilderness of Western Tanzania, five hours hard driving from Kigoma and four and a half hours from Mpanda over poor unsurfaced roads. Isolation was said to be likely to become the major problem at Mishamo now that the Government has taken over responsibility for its 34,000 Burundi inhabitants from the U.N. High Commission for Refugees. The article goes on: “Like earlier refugee settlements, Mishamo is beginning to yield distinct benefits for both refugees and the host community now that the arduous task of establishment is nearly complete. Mishamo’s residents now enjoy standards of health care, education and water provision at least as good as the surrounding district. With each family cultivating their own substantial (five hectare> plot, Mishamo was virtually self sufficient in food after only two farming seasons. And with the cultivated area increasing by 2000 hectares each year, the settlement raked in an impressive 4,500,000/- from surplus crop sales and three million shillings in Tobacco sales, the main cash crop last year. Each village centre is the focus of community life based around the rural development centres, churches and co-operative groups. But Mishamo has other problems apart from its isolation according to the article. One is the increasing population pressure causing parents to subdivide their plots of land. Another is the dependent mentality of some settlers who have been receiving assistance for up to thirteen years and may have not yet developed a spirit of self-reliance. The whole thing started in 1962. In the spring of that year, John (J.V) Shaw, whom many will remember as a senior member of the Provincial Administration in what was then Tanganyika, was appointed General Secretary of the Victoria League for Commonwealth Friendship which was then based at 38 Chesham Place, London, SV1. John’s appointment was very shortly followed by the election of the late Lord Twining to be Chairman of the League. These appointments were being made only shortly after Tanganyika had achieved her independence in December 1961. The months immediately following this event were marked by the return to Britain of a considerable number of people who had previously been in Government service in that country. Now, no-one who remembers the ebullient personality of Lord Twining who had been Governer from 1949-1958 will be the least bit surprised to learn that he gave encouragement to the view that it would be a splendid thing if, from time to time during the year, informal gatherings should take place so as to reunite those of us who had lived or worked (and, as I am fond of pointing out, some of us actually did both) in Tanganyika. And what better place to hold these meetings than the Victoria League with John Shaw by then firmly in the saddle? According to John’s own memory, which must surely be the best authority available, this first “get-together” was in late 1962 or just possibly, early 1963. In any event, we are assuming it was in 1962, and so we shall, this year, treat the 1986 party as our Silver Jubilee. There may be some raised eyebrows at the need for such an assumption. Surely our records should put the matter beyond doubt? Certainly, but as far as I or anyone else can discover, there just ain’t no records. I did say the gatherings were informal! Obviously, however, they were successful for by 1971 no less than three sundowners were being held each year. They were always held at the Victoria League under John Shaw’s genial management and John was ably assisted on the clerical side by Nora Young. My records go back to 1971, the last year in which the Victoria League was host to these gatherings. The charge was then 10/- each. Some time in early 1972 at just about the same time that John Shaw retired from the General Secretaryship, the Victoria League decided upon a major change of policy which involved the future usage of 38 Chesham Place. I was asked by two former Provincial Commissioners, Mike Molohan and “Fanny” Waldron if I would be prepared to take over the running of the reunions and find a venue. They had already recruited Vicky Young who had recently retired from the East Africa Office in Trafalgar Square, to assist me with the administration and paperwork of these gatherings. I gulped and said “yes” and little did I imagine at the time that 14 years later the parties would still be happening. Vicky has been a tower of strength aver all these years. The first decision that we came to was to reduce the number of parties to two each year. The second, after a good deal of shopping around, was that we would hold them at the Royal Overseas League. On this basis we continued until 1986. All the time great care had to be taken to balance the budget, for we had (and have) virtually no reserves to fall back on to cover any possible losses. In 1977 after considering the numbers then attending in relationship to the cost, we decided to reduce the frequency to one party each year. At about that time also we decided to change the venue to the Royal Commonwealth Society. I discovered also that if the date could be arranged to coincide with the Test Match at Lords, there was an added incentive for those living in, for example, Scotland or the West country to come up to London. Inflation and the increasing costs which resulted also persuaded us that we must budget so as to be on the safe side of danger. As a result we have been able, since then, to make each year a modest donation to the Overseas Pensioners’ Benevolent Fund from the usually equally modest surpluses. So now the reunions continue. It is remarkable how each year we seem to attract new “recruits” who have only recently heard of the function for the first time. The parties are open to everyone with Tanganyika connections, their spouses and children of drinking years. For several years now we have been delighted and honoured to entertain H. E. the High Commissioner and his wife as our guests. People really seem to enjoy themselves; certainly so if noise is to be the criterion. Long may they continue! Vicky and my wife (who helps a lot) and I are determined that they shall do so as long as people show that they like coming and as long as we can keep them financially viable. To the President of the Britain-Tanzania Society. I want to thank you very much for your letter of 11th November, enclosing the booklet in which so many friends pay so much tribute to my service as President of my country. I do not know how to thank you and my friends of the Britain-Tanzania Society. The Wazanaki have a saying: ‘Courage is among men’; meaning that no single individual can achieve without the support of others. I have been almost uniquely fortunate in the support I have received from many loyal friends both in Tanzania and outside Tanzania. I wish I had done more to deserve so much support and loyalty. May God bless you all. Moving house is a very difficult business, I discover! But I am gradually settling down although some of my stuff is still coming. I did not realise I had accumulated so much property, especially books! The problems of this country remain acute; but the President has a very good team and they are doing all they can to cope with them. Please convey my gratitude to all my friends in the Society. The following comments on “The Nyerere Years” in Bulletin No. 22 based on my experience as British High Commissioner in Tanzania from 1975 to 1978, may be of interest. In his article on Nyerere’s political thought. Professor Cranford Pratt refers to “the major national effort from 1968 to about 1975 to introduce ujamaa socialism in rural Tanzania”; and to “the ‘forced march’ to ujamaa socialism which was attempted in the mid-1970s.” The latter phrase seems to reflect the widespread but mistaken belief that in the mid-1970s rural farmers were compelled by force to adopt ujamaa socialism and establish ujamaa villages. This misconception arises from confusion between two separate concepts; the ujamaa village and the process of villagisation. Until the mid-1970s the Government relied on peaceful persuasion; there was no compulsion, though no doubt in some cases considerable moral and other pressures were applied by keen and ambitious Party leaders. But progress on both counts was slow; in particular the individual homesteaders were reluctant to leave their traditional plots to set up in a new village some distance away. The Government accordingly decided that in order to achieve satisfactory progress on education, health. etc., villagisation would have to be made compulsory. The aim was laudable enough but the implementation, with inadequate planning and preparation and. often brutality, was disastrous. The consequent disruption of agriculture and alienation of the farmers who had been forcibly removed from their homes was an important factor in the decline of agricultural production in the m.1d-1970s. However, at no stage was force used to compel either the new villages or the existing villages to engage in collective farming and become ujamaa villages. In 1977 – two years after the ‘forced march’, President Nyerere told me that only a small percentage (I think of the order of 10%) of villages were ujamaa. Moreover, even in an ujamaa village individual families were allowed to keep a small plot for their own use; and no family was compelled to engage in collective farming – in Nyerere’s own village of Butiama which was considered an ujaaaa village, out of over 500 families only some 100 took part in farming the communal land. In other words the application of the ujamaa concept in farming remained, and as far as I am aware still remains voluntary. To the Secretary, Britain- Tanzania Society. You asked us to comment about Bulletin No. 23. We like the size as foreshadowed in No.22. More handy and comprehensible than the old type but we have one major criticism and realise that this may not be easy to achieve with the smaller size document. The letter press is far too small and difficult to read. Can we have size as No.22 and printing also as No.22 ? Myrtle and Philip Radley, Cambridge. I for one prefer the reduced size of the Bulletin. Furthermore, being smaller it is less heavy and should on average cost less to post so I favour the reduced scale version. One more comment. The extracted quotes from Mwalimu’s farewell speech in this recent Bulletin are good reading. I can’t recall having seen a full version of the speech. Maybe I’ve just missed it. But if it has not been published it would be worth reproducing it in full. The speech fills a 38 page booklet and would require the exclusion of almost all else if it were to be published in the Bulletin. I am sending you my last copy of the speech – Editor. Many thanks for the marvellous Bulletin about Julius Nyerere. It wouldn’t be so bad if other political leaders everywhere could have kept his approach to life and friends. But it is perhaps to hope for too much. What is being said confirms much of what I have heard about Nyerere. The publication would merit a Swedish version. Since independence peasant farming has received great emphasis in Tanzania at least at the rhetorical level. In his inaugural address to the Republican Parliament on 10 December 1962 President Nyerere said that “Tanganyika is in fact a country of peasant farmers… for this reason, in drawing up our Three Year Development Plan, Government decided to lay the greatest emphasis on agriculture. But it is ridiculous to concentrate on agriculture if we are not going to make any change in our old methods of cultivation and our old ways of living. .. The hand hoe will not bring us the things we need today.” He realised, as he does today , that peasant agriculture was operating under enormous cultural and technical constraints associated with the mode of life, traditions and customs of the peasantry. He envisaged this change taking place only if rural people stopped living in scattered homesteads in the countryside and started living in nucleated villages. Nyerere’s concept of village community life was not limited to the advantages to agriculture from the use of tractors and oxen, or the provision of social services which he regarded as essential prerequisites to the improvement of t he quality of life in the countryside, but he also envisaged villages as providing the basic units of participatory and democratic government. Thus, Nyerere’s ideas for improving the life of people in the rural areas embraced a wide spectrum of objectives – political, social, economic and cultural. These aims were encapsulated in the philosophical concept of ‘ujamaa’, a vision of rural life that would give substance to his beliefs about human development. However, early attempts to promote the resettlement of the rural people in villages proved abortive. It was only after the publication of the Arusha Declaration in 1967, which set out a new national development strategy based on socialist principles, that the peasants began in any numbers to move into villages, known popularly as ‘ujamaa villages’. The key elements of this new policy were education and persuasion, resulting in voluntary movement into village communities. Even so, by the middle of 1973 it was evident that villagisation was proceeding at a pace much slower than expected and in October 1973 the Party directed the Government to ensure that all rural people were living in villages by the end of 1976. In 1973 there 5,628 villages in mainland Tanzania with a total population of just over two million representing about 15% of the total population of mainland Tanzania, but by 1976 the number of villages had increased to 7,684 embracing a population of over 13 million, or 81% of the total. Nyerere’s concern for the welfare of rural people stems from the fact of his own peasant origin and his continuing close links with village life. He is a full member of Butiama village, the home of his birth, and delights to visit it whenever he can spare time away from the burdens of party office. He participates actively in village activities and works on the village farm alongside his fellow villagers. It is common knowledge in Tanzania, especially among the bureaucratic elite , that when it comes to working with the hand hoe or machete it is not advisable to stand close to Nyerere. You just cannot match up with his zeal and vigour and will only end up in shame and dejection ! It would however be misleading to attribute Nyerere’s concern with the welfare of the peasantry solely to his own close links with the countryside. His belief that poverty is incompatible with social justice and human dignity underlies the emphasis that he has placed on increased agricultural production by the adoption of modern methods of cultivation as the key to individual fulfilment. After independence the Ministry of Agriculture’s extension services were entrusted with the task of providing training in improved farming practices and exercising a measure of supervision over the application of modern methods of crop management and animal husbandry. Extension staff were also expected to concern themselves with the timely procurement and distribution of agricultural inputs as well as giving advice on their proper use. The field extension worker – the Bwana Shamba – was, and still is, a key Government agent of grassroots development in the rural economy. There were of course difficulties arising from traditional practices and the natural conservatism of peasant populations. But the central problem lay with the extension workers themselves. There was truth, if also a measure of exaggeration, in President Nyerere’s remark in October 1985, that he could dismiss all the extension staff in the country and there would be no change in agricultural production. -poor links between research and extension, with the result of poor or no dissemination of research findings to the peasants. There were also serious pedagogical shortcomings, which Nyerere was quick to recognise. Himself a trained teacher, he realised that old-fashioned didactical methods were almost useless. Thus Nyerere put his faith in the demonstration plot, in working with and alongside the peasants. To communicate new methods to the peasantry it was necessary to provide objective proof that the new technology worked. In the past Government allocations of resources to agriculture have fallen short of the rhetoric. Between 1976-77 and 1981-82 the agricultural sector received an average of only 10.1% of the development budget at central and regional level. Only after the President’s address to the National Conference of CCM in October 1982 did the Government begin to raise the budgetary allocations to the agricultural sector. In 1983-84 the allocation was 23.4% of the development budget, in 1984-85 28.4% and for 1985-86 30.7%. But the problems of Tanzanian agriculture did not flow from inadequate capital allocations alone. Other causes were the poor distribution of inputs, inadequate rural credit, late cash payment of peasants by the crop authorities, poor marketing organisation, erratic pricing policies, wastage caused by pests and vermin and inadequate warehousing facilities. Agricultural research was inadequate and often irrelevant and information poorly disseminated. Above all there was the unreliability of the weather. Although, therefore, agriculture has been recognised as the mainstay of the Tanzanian economy at least as far back as 1967, in practice peasant farming, which is by far the largest component of agricultural activity, has been neglected but this situation is now changing and there is a greater awareness of the crucial role of agriculture. Substantial increases in producer prices have been a signal to the peasants of the importance now attached to their work, even if the shelves in the village dukas, where money is converted into things, remain relatively bare. Above all, the atmosphere in which agricultural activities are undertaken is now changing and as the obstacles in the way of production, distribution and marketing are mastered one by one there is now real hope that the agricultural potential of Tanzania will be realised and that the long term goal of self-sufficiency in foodstuffs will at last be reached. Ndugu JUMA NGASONGWA is on the staff of the Sokoine University in Morogoro dealing with Development Studies. The relatively recent recognition that sub-Saharan Africa is in a deep crisis has fostered many inventorial studies on African affairs. Research endeavours and particularly those in agricultural research have not been excluded from this review rage. And the resulting diagnosis is as negative as on most other subjects studied. These recent reviews on agricultural research have a few main conclusions in common. Firstly the present situation has its roots in the colonial past, in which a dual agricultural economy emerged: a plantation economy serviced by a network of scientific institutions alongside an African subsistence economy which received little or no scientific attention. This situation largely continued in national research efforts after independence. Secondly, the slow expansion rate of University faculties of Agriculture may be taken as the main cause for the present severe shortage of agricultural scientists, despite long-standing commitments to become more self-reliant in this field. Thirdly, courses at African Universities often use curricula developed outside Africa or by outsiders with too short an experience inside Africa, and there is a general tendency of those remaining in research to continue working on subjects largely irrelevant to local smallholder production. And finally, traditional knowledge on local conditions is not valued. Rarely do researchers and extension workers undertake the additional burden of listening to farmers who are using few inputs from outside and inviting them to participate in outlining, performing, validating and using the results of research. Whether the last two conclusions will continue to be drawn in the near future depends heavily on the national impacts of recent international trends, because internationally increasing attention is now being directed to local farming systems and smallholder participation in collecting, researching and disseminating the locally most successful traditional agricultural practices. This kind of research, with what we may call an ethno-scientific approach, will not be the only one needed. But as long as most of the African -subsistence (or near-subsistence) farmers will have to practice a low external-input agriculture (with respect to their food crops) it will be an extremely important one. Only if this research policy and other policy measures have led to improvement of their conditions, may research on the introduction of seed, fertilizer and water applications specific to the smallholder economy be able to support the next step upwards. How to tap local knowledge? 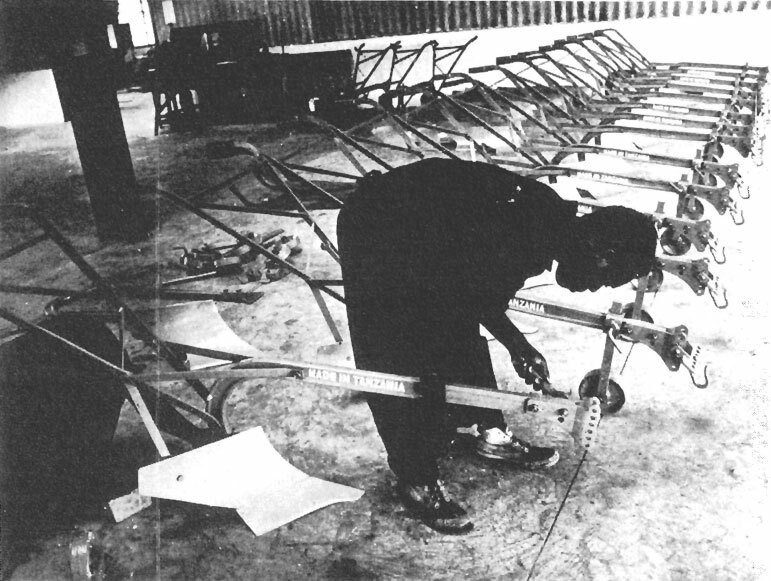 The author spent five years (1975-1980) with counterparts and students building up teaching and an infrastructure for research in physical aspects of agricultural meteorology at the Physics Department, University of Dar es Salaam. However, in that whole period we completely failed to obtain local information on a subject thought to be extremely important for research: how traditional farmers in Tanzania learned by trial and error to modify the microclimate of crops to improve quantity, quality and above all protection of their yields. This failure was, after all, understandable against the background of the conclusions reviewed above. Only limited attention had ever been paid to traditional methods of managing soil, water and vegetation, but the least attention of all had been accorded to local knowledge acquired on management and manipulation of the microclimate. This had been recognised by Professor Gene Wilken, a geographer at Colorado State University, who had made a preliminary review of examples of such modifications applied by traditional farmers from all over the world in 1972. But nobody in agricultural meteorology and microclimate research appeared to pick up the challenge his review provoked. Failing time and again to obtain much information along the official lines, even after having established with colleagues of the Tanzanian Directorate of Meteorology a National Agrometeorological Committee, we resorted to a scientifically unorthodox method: tapping the public at large through a newspaper contest. Of course, in Tanzania still close to 90% of the population works in agriculture. And even among those reading local Kiswahili and English newspapers the large majority come from rural areas and families. Very many of them have their own low-input “shambas” (agricultural plots) to help them to survive with little means, the harsh economic conditions of the city and/or they have close relatives who are farming and with whom they have strong social links which yield mutual support in harsh times. Knowing we would not reach small peasants directly by a newspaper contest, we hoped to reach those newspaper readers and we stimulated them to write up their examples by offering generous prizes for the best (reviews of) examples. The contributions we obtained, late 1980/early 1981, were generous in number (more than a hundred) and in more than 25% of cases extremely useful and of high quality. From these we first made a catalogue, a shortened version of which is given in the Table. This shows which manipulations and which kinds of management are used by traditional farmers to modify the microclimate of crops and produce. We were also able to single out a series of subjects which appeared most important and least studied from the point of view of traditional applications. These were shading, mulching (covering by a layer different from the original soil), wind protection and modification at/or surfaces. Other important conclusions were that the examples collected were often extremely local in their application and that there was much room for dissemination of such practices. Shading is a subject about which a reasonable amount of knowledge has been collected on plant physiological aspects, but hardly any work has been done on aspects relevant to the agricultural meteorology of smallholder farming systems such as agroforestry and other multiple cropping systems. Labour intensive systems using soil and seedling protection and modification of soil temperature and moisture conditions by mulching have been studied extensively in horticulture, but the trend towards more and more climate controlled greenhouse cultivation in Japan and the Western countries has appreciably diminished research in this area. This is even more true for the materials locally available in the tropics. Wind protection by traditional farmers in the tropics appears to be completely different from the single and multiple row windbreaks used and researched heavily in more developed agriculture. Protection at four sides (or nearly so) and making use of wind reduction by scattered obstacles such as trees and bushes are found to be extremely important but there are hardly any studies of the efficiency of such systems. Finally, the exposure to the atmosphere of and the impact of the environment on agriculturally relevant surfaces is often modified in ways very particular to traditional technology. This applies to various managements and manipulations such as traditional irrigation, drying, storage and soil and crop protection. Once the “state of the art” was discovered from studying the Tanzanian examples we did two things. We singled out a few subjects for local MSc research and we tried to rouse international interest in traditional microclimate modification, so as to be able to confirm our findings elsewhere in Africa, in Asia and in Latin America. An official report will be published this year by the World Meteorological Organisation whose Technical Commission for Agricultural Meteorology singled out the subject in 1983 for a specialised Working Group study. The MSc work in Dar es Salaam concentrated on the efficiency of local grass mulch applications, in cooperation with the Tea Research Foundation of Kenya, where efficiency of erosion protection and temperature manipulation by mulches had been studied. Temperature modification and shading efficiency of the same mulches were now studied in Dar es Salaam with the infrastructure built up earlier and physical theories to explain these efficiencies were developed. The result was an operational method of determining quickly the thermal efficiency of local mulches and provision of advice (which we call weather advisories) for farmers on quantities and qualities of dry and live grass mulches traditionally applied. This kind of work showed that even at the MSc level research may be done that can be relevant to low external-input agriculture. Much more has to be done before we have developed a new area of applied research in agricultural meteorology which can be carried out by Third World research students and supervisors and which is rooted in tapping local traditional knowledge. Based on the Tanzanian experience the author has recently started a project in which he co-supervises PhD research in Kenya, Sudan, Tanzania (with India to be added soon) on the four main subjects reviewed above, by backstopping from the Netherlands and frequent travelling. We are working on the effects of the re-introduction of traditionally applied light shade in tea growing in Kenya, a traditional irrigation method and its water use efficiency for groundnut and sorghum compared to “laissez faire” furrow irrigation in the Sudan, traditional wind protection from scattered trees against wind erosion effects and of parts of homegarden systems against mechanical wind damage in the Sudan and Tanzania respectively. It appears that tapping local knowledge works in research on low external-input agriculture. But for this to happen it is essential for farmers and extensionists to be involved from the beginning. Only then might we be able, in places where the population pressure is not yet the all-determining and all-overriding factor, to improve a bit, in some cases, on the efficiency of traditional methods. But, even more important, we might in this way succeed in disseminating such traditional technology, now better understood, to places and conditions where it was not applied before. Dr. C. J. STIGTER was a Professor of Physics at the University of Dar es Salaam from 1975 to 1984. He is now a Principal Research Scientist at the Wageningen Agricultural University, the Netherlands.